Hey guys, I think to pursue with my blogging dreams I need alot more beauty items in my collection. Well I think that's a good enough excuse to go shopping, if not what is? Ha ha. My skin is so bad all the time, I think it's because I'm a teenager and my hormones are running wild but sometimes I am at my wits end with it. Sometimes it's so dry foundation looks awful, Sometimes it's so oily my make-up slides off, Sometimes it's got so many blemishes I want to cry and Sometimes it's so nice and smooth that I go bare faced everywhere. I don't do much skin care. I take my make-up off with make-up wipes. I recently have been using Simple Make-up Wipes and so far I like them but I think I like my previous ones more. They were from Primark and cost £1 for 50 wipes. Here's my wishlist of skin care products and a teeth thing (couldn't resist)! Herbalism Facial Cleanser : I raved about this months ago in my Lush Blog Post (here), I still want everything on that wishlist though aha. I spoke briefly about this along with loads of other stuff. I will have it one day :) The thing that gets me with this product is that it's got nettles in. And other very organic ingredient, at the moment my skin needs some TLC so I am really looking forward to getting this soon. This is £6.75 for 100g. Garnier Fresh Refining Toner Shine Be Gone! 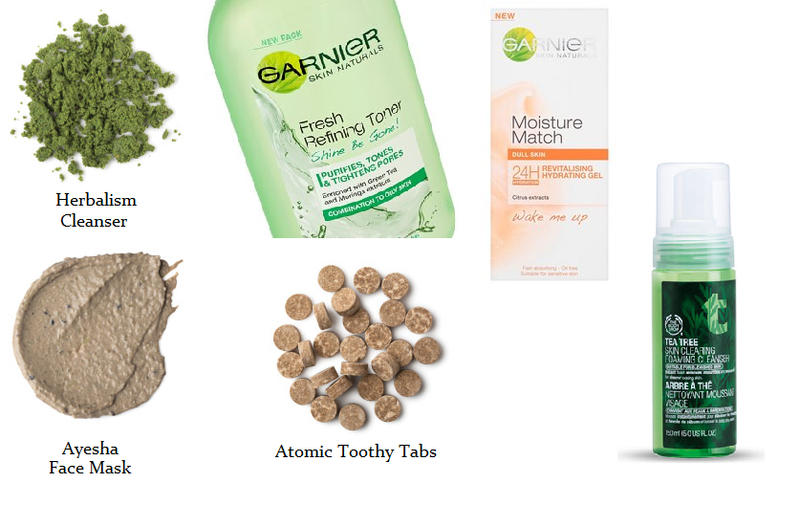 : I was looking for a good toner everywhere and I thought the micellar water from garnier. I see all the youtubers and blog writers raving about it but when I went onto the Superdrug website their was a whole line of toning waters. I have a very oily T-zone so thought this may do the trick as it is mattifying. It is cheaper than the micellar water but I am hoping it is still good. When my mum is buying this for christmas she'll probably be thinking i'm mad it's just water:) This is £2.19 for 200ml. Garnier Moisture Match Hydrating Gel Wake Me Up : This is from the same brand but really drawn by attention. I find it so hard to wake up in the mornings and when I do my skin feels horrible when applying make-up. A hydrating gel sounds lush, cooling and reviving my skin in the morning. This is £3.99 for 50ml. We use moisturising honey and fresh asparagus and kiwis in this brightening fresh face mask. Fuller’s earth and witch hazel absorb dirt and oil, helping to tighten the skin, whilst elderflower vinegar and elderflower oils balance out skin tone. How nice does that sound?! This is £6.50 for 75g. Tea Tree Skin Clearing Foaming Cleanser: When I was reading the reviews alot of them said it helped with their breakouts, didn't dry their skin and some even said it helped with their oiliness. Honestly it sounds like heaven in a bottle but is it too good to be true? I hope no because if I am ever in The Body Shop with £5 I will be tempted to buy it!! QOTD : What's your holy grail skin product?